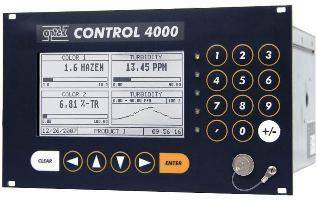 The Control 4000 is a powerful, microprocessor-based photometric converter. The advanced modular design enables precision process monitoring and control. The flexible C4000 is designed for optek ultraviolet (UV), visible (VIS), near-infrared (NIR) absorption-based and scattered-light based sensors. The menu-based software is easy to use and configure and is available in German, English, French, Dutch, Spanish, Russian and Portuguese. The high contrast white display is easy to read and remains configurable. The graphic display can show absorbance, transmittance and concentration in real time and in any unit of measure such as CU, ppm, EBC, FTU, and g/l. These measurements may also be displayed as text, bar graphs or trend values. The C4000 software includes adjustable signal damping, 16 linearization tables, and advanced calculation capabilities. As an additional feature for scattered light sensors a factory zero point is implemented. A secondary zero for additional offset as well as a slope adjustment is included. This manual adjustment can be used to compensate for long-term process related disturbances. An integrated data logger captures vital process information for quality assurance and plant control records. This data is easily transferred to a PC via an RS232 port. The C4000 series converters provide multiple analogue and relay outputs for direct measurement and control. An optional remote card allows process functions such as product switching, ranging, remote zeroing, and hold to be triggered remotely from other process control instruments or systems. Some models are capable of multiplexing up to four optek inline sensors and/or probes. The Control 4000 series converters are now available with an optional PROFIBUS® PA interface, which fulfils the Application Profile for Process Automation Version 3.01 with amendment 2. Using cyclic as well as acyclic data traffic the measuring results can be read out together with their corresponding information and product specific settings such as limits of the measuring range and the names of the units. The converter has eight product selections that can be independently configured. Each product can be setup with four measurement results, three alarm points, up to eight offset + slope sets and up to sixteen linearization tables. These pre-configured products can be changed locally or via access to an individual register via the bus.